If you are looking for the perfect place to master kitesurfing, look no more. This kitesurf camp is located in Kalpitiya, the North West province, and is the main spot for kitesurfing in Sri Lanka. In this kitesurf camp, you will learn to kitesurf in one of the best, most beautiful spots in the world! Located in a rural area, you will live side by side with the local people, which you will find friendly, welcoming and hospital. You will have the opportunity to enter into the Wilpattu National park, by boat, to discover the beauty of this park from the river shore. Our staff consist of profession IKO certified teachers and our equipment is due to the highest standards. We provide a various range of offers, to all level of kitesurfers. Our skilled staff will be with you from beginner to advanced. Rentals are possible. We also provide free storage of your own equipment. We offer boat rescue and support. 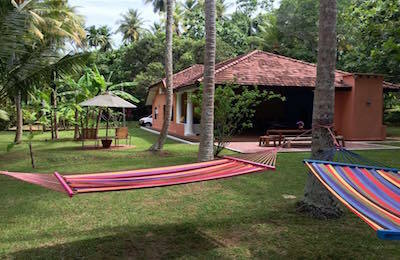 A charming and small kitesurfing camp located in the small village of Setthawadiya neighborhood, between the Kitesurf Lagoon and the village of Kalpitiya. You will find yourself surrounded by rural, unspoiled nature, avoiding big tourist resorts and meet the real Sri Lankan culture. We provide quality and clean accommodation in our villa and in our four tropical chalets. Whether you come for kitesurfing or simply to discover the beauty of Kalpitiya, you will live a unique Sri Lankan experience! We offer a great cancellation policy, including refunds on cancellation made due to wind conditions. But do not worry too much about this, we are located in one of the worlds most wind-proofed spots. Check out or cancellation policy! We also have four very charming tropical style chalets. Live a unique experience in one of our chalets. These quality rooms have both attached bathrooms and an indoor garden with a natural shower. Come and enjoy the best Sri Lankan food in our Shark Bar. The bar is where we serve your food, get our drinks, cuddle with the pets and play our guitar. We serve home-made traditional food, providing all the energy you will need for kiting! Kalpitiya is n the only best place for kitesurfing in Sri Lanka, but one of the best destinations in the world! The village of Kalpitiya is located on the shores of the Indian Ocean and the northernmost point of the peninsula of Kalpitiya, with strong winds during the months from May to October and from December to March. Kalpitiya lagoon with its flat waters is ideal for beginners and freestyle enthusiasts. On the other hand, the Indian Ocean, separated from the lake by a small strip of beach, it’s the best choice to navigate between waves with endless winds and sublime landscapes. Do you think it is a coincidence one of our favorite spots are called dream spot? Imagine yourself getting into equipment and taking a one and a half hour trip to one of our tropical islands, during a downwind kite safari, how much better can it be? We arrange various kite-trips, going to different islands and we always go in groups. If you are planning to come to Sri Lanka for kitesurfing and do not want to carry all your kiteboarding material, we provide a variety of kites, harnesses, and boards for rent at very competitive prices. We offer a personalized rental service and in the very rare event that it is not windy and you can not enjoy kitesurfing, we are not going to charge you for it! Kitesurfing instruction is also available, do not hesitate to contact us if you need kitesurfing lessons. Actually, Kalpitiya is a paradise for lovers of this sport. In addition, natural and unspoiled environment makes this a unique place in the world. If you also are passionate about adventure, if you want to know the culture of Sri Lanka and its people and want new experiences, you cannot miss this idyllic place. As the tide is very low the lagoon is kiteable at all tides. The main attraction for kitesurfing in Kalpitiya is the flat and shallow water of the lagoons in the surrounding areas, as the Puttalam Lagoon, the Kalpitiya Lagoon or the Kappaladi Lagoon. There are many islands on the north of Kalpitiya too, with perfect spots for kitesurfing in flat waters, as Vella Island. Furthermore, the Indian Ocean is also a perfect spot for wave riders from May to October. 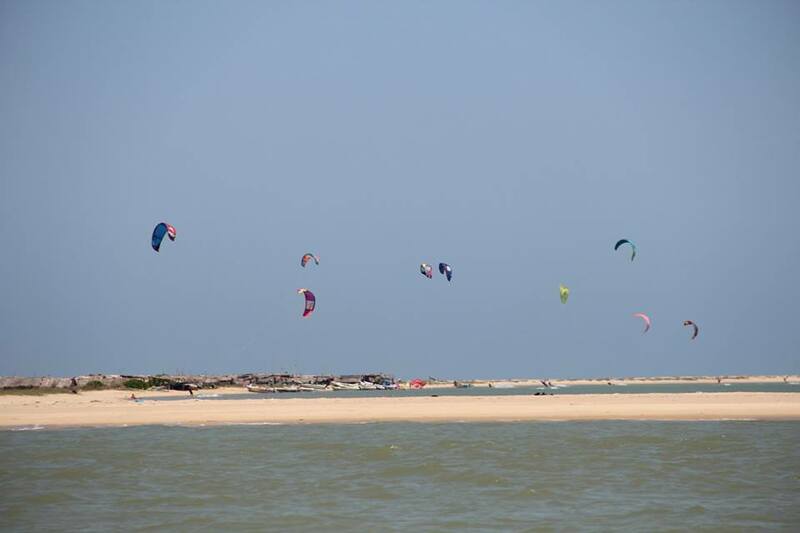 And it’s just that there are many places for kitesurfing in Kalpitiya! The small lagoon of Kappaladi is located in a very beautiful area only 20 km south of the town of Kalpitiya. Either the flat and shallow water of the lagoon and the wind conditions make this place a very good kitesurfing spot for learning and for freestyle. The Kalpitiya Lagoon, the most known spot and much bigger than the Kappaladi lagoon, is located very near to the town of Kalpitiya. This lagoon, located also in a very unique and safe environment, it is where the main kitesurfing schools are located. In the vast Puttalam lagoon, there are no kitesurfing schools yet, but the constant wind, the subliminal landscape and the uniqueness of the place make this spot very special and one of the best places for kitesurfing in Kalpitiya. Besides the lagoons of Kalpitiya, Puttalam, and Kappaladi, which all of them are flat water, the best kite spots are located on the islands north of Kalpitiya, Vella Island being the best! Vella Island is a tiny island that has the sea on one side and the flat water of the lagoon on the other. When it is windy, the freestyle conditions in this place are perfect. However, Vella is not the right kite spot for someone learning, especially in the season from May to October, when the wind is offshore in the lagoon. This island is about 50 minutes by boat from Kalpitiya and it is possible to do a round trip in a single day. For those who love kitesurfing in the sea, another place worth to mention is the Donkey Point, a cape located about 10 km south of the town of Kalpitiya, and it is the spot often chosen by people looking to navigate between the waves of the Indian Ocean. We can organize countless trips around Sri Lanka, from one day up to two weeks or more. Thanks to the experience of our driver and the comfort of our vehicle, you will enjoy the island like no one else. Have a swim in unspoiled beaches, discover temples and ancient cities, enjoy unusual landscapes and observe nature in its purest form. If you like fishing, you will be able to fish with local fishermen in the surroundings of our camp. They will be more than happy to bring you along and show you their ancient art of fishing. Kalpitiya is also one of the best areas of Sri Lanka for diving during the months from November to April. The reef has great biodiversity and a lot of places yet to be discovered and where you can see a lot of beautiful marine fauna such as butterfly fish, parrot fish or black tip sharks. The reef covers about 307 square kilometers and is ideal for novice divers. In addition, during these months, in the waters of Kalpitiya also you can sight whales and dolphins. We can organize countless trips around Sri Lanka, from one day up to two weeks or more. Thanks to the experience of our driver and the comfort of our vehicle, you will enjoy the island like no one else. Have a swim in unspoiled beaches, discover temples and ancient cities, enjoy unusual landscapes and observe nature in its purest form. Each place of Sri Lanka is a magical and different place, where the diversity of cultures and the multitude of landscapes allow this island to have everything you need to live one of the best experiences of your life. Simply tell us what your idea of travel is and leave the rest to us. It is located in Setthawadiya neighborhood, between kalpitiya town and the main spot for kitesurfing. From our place you will be very near to all the interesting places, as the fish markets, the dutch fort or the beach. Kalpitiya is located to 165 km North from Colombo. You can get here by bus/car for about 3.5 hours drive. Public transport is available from Colombo to Puttalam. Get of in either Puttalam, or Palavi Junction and take one of the regular operating busses 80 LKR, 1,5h. Also you can hire a van with driver for 7000-8000 LKR from airport of Colombo. ✔ 7 nights accommodation in a private tropical chalet. Airport transfers provided for an additional charge on request. "I had I sort trip in Sri Lanka with my friend. He has been there before so he had the booking..walking distance from the lagoon which is the spot to kitesurfing. I was totally satisfied with his choice, the place is awesome. Natural stylish wooden cabanas with hilarious bathroom. We ordered dinners several times and we've never regretted it. The seafood bbq,unbeatable as Ruben makes it. Strongly recommended everyone who loves the nature.and good food. Big thanks for Ruben (the owner) all for his help." "Nice bungalows and comfy house. Very good ambiance in the village mostly with Rubben and his team. Very good guys, helpfulls and kinds. I am not a kite surfer but it was good to stay in a place different style from the others places in SL. Thank for the good moment. if u r looking for a nature style place with good price and nice feeling i recommand the village. and thank for accomodate the tuktuk rent it was so fun"
Great alternative to kite bases. "We spent a week here and everything was great. We went to Kalpitiya for kitesurfing but didn't want to be chained to a kite base, as it tends to get a bit "all inclusive" experience. The villa was very comfy and had everything we needed. Ruben who runs the place is a great host and seems always happy to help! Don't waste time looking for restaurants around. Just order sea food dinners from him. It's the best you can get around Kalpitiya." "We stayed at this beautiful, easy going place for two nights and enjoyed every bit of it. Ruben is a very nice host who was always there for us. He also gave shelter to Tommy, an injured dog, that we fell in love with (I really hope his legs will get well). The cabanas with the open air bathroom (secluded in the back) was probably the best place we were lucky enough to stay at during our trip through Sri Lanka. Thank you for welcoming us and all the best!" "My friends and I went there for a few days and we just loved it. It is a very chilled place to stay. The rooms are wood houses and it feels like you were in a fairy tale. People come to do kitesurfing however we just came to relax from the tirying backpacking trip we had. Moreover, Ruben ( the boss of the place) is incredible nice and sweet and he help you out for everything you want. No bad words for this place I have to say. I totally recomend it to everyone ( families, couples, friends, etc). ❤❤ In love with this place❤❤"
"This was our first time to kalpitiya and not the last, we spent 4 amazing days at this place, the cabanyas are quite new and clean. The room was equiped with just what we needed to enjoy the stay. The staff where very nice and thoughtful . I asked to arrange a small bday surprise for my girlfriend and they helped. They really make our stay unforgetable. I defintly will go back for other weekend."